It is always fascinating to watch a band undergo metamorphosis, to see how they progress as musicians and as people. In the case of Frightened Rabbit, there is no exception. Painting of A Panic Attack demonstrates the peculiar growth that comes with important life changes and artistic decisions. This album, the latest release from Frightened Rabbit since they announced a short hiatus after Pedestrian Verse (2013) dropped, was produced by the puppet-master himself, Aaron Dessner. 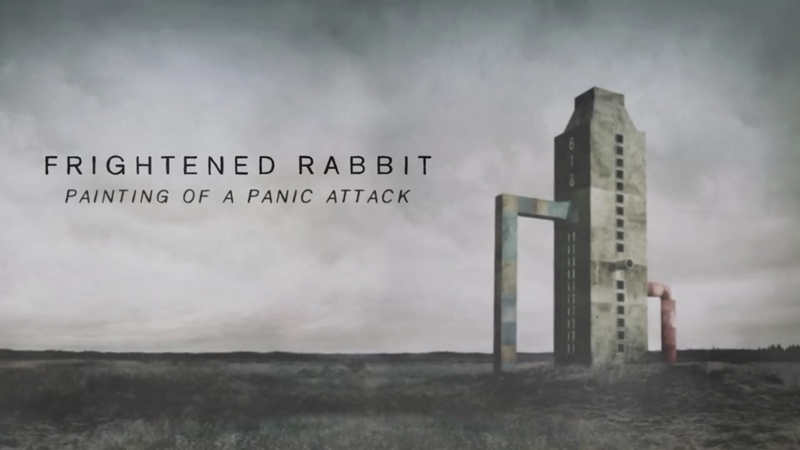 With Dessner’s Midas touch and signature sounds that are best-heard through The National, Painting of A Panic Attack has shown a new angle of Frightened Rabbit, one that previously had not been explored. The draw for many FR listeners has been frontman Scott Hutchinson’s raw/emotionally unstable/poetically blunt lyrics, but this album swivels the spotlight onto production and instrumental technique. With a powerhouse such as Dessner behind the scenes, it was an inevitable endpoint, and mostly a very successful one. While the reeling, reckless effect is dampened, the quintet’s sound has never been more unified. What started out in 2003 as a one-man show is now a relatively well-oiled band, where members get a say in the making of the songs; Hutchinson has pulled back for the time being to integrate with his bandmates, resulting in the subtle change in sound. While at times the album starts to blend together in a small storm of moody meditation, there are definitely some tracks that deserve a special mention. “Death Dream,” the opener that includes the titular lyric “A still life is the last I will see of you/A painting of a panic attack,” demonstrates the band’s shift from the get-go. A quietly shimmering track, slow layering and crescendoes create an ethereal, dream-like scape on which Hutchinson bawls some of his darkest lyrics yet. It is quite a sobering opener, establishing both Frightened Rabbit’s status quo and signaling a definite maturity. “Get Out” follows next, a lighter and more upbeat track that flirts with synth and features some very nice drum work from Grant Hutchinson, brother of Scott. Dessner’s influence is heavily felt in this track, which is one that utilizes electronica to a good extent. “Woke Up Hurting” is a staccato, sleek backdrop for Hutchinson’s unique voice, reinforced with full harmonies from the rest of the band members. The familiar tambourine is featured among fuzzed guitars and a strong drumbeat, but that is just about all that remains from previous albums; the sound is very polished and well-rounded. “400 Bones” turns the spotlight onto the piano and Hutchinson’s heart-wrenching lyrics, but then morphs into a track fit for a National album; you almost expect Matt Berninger to lope onto the scene with his bass croon for a duet. “Lump Street” simmers with synth and reverb vocals, a vaguely sinister sound that is Pedestrian Verse-era FR with an indie pop twist. “Die Like a Rich Boy” begins with an acoustic guitar and Hutchinson’s sweet voice, and then continues with a melancholy piano melody; a slow, sad build that cuts right to the core. Painting of A Panic Attack is bathed in a quiet intensity, with both the lyrics and accompaniment featuring a slightly more restrained aspect. Previous albums provided listeners with a hearty dose of Scottish miserabilia, highlighting rough instrumentals and equally raw vocals; now sleeker instrumentals lessen the blow of Hutchinson’s fatalistic lyrics. The album is patient, and brooding, a window into an introvert’s neuroses; it is Hutchinson’s inner monologue that comes through, rather than blustery poetry shouted to the sky. There is less raw, animalistic emotion in his lyrics; instead, listeners can hear its echo in the music. The new shift in sound is also indicative of a détente for the band; Hutchinson (and by extension, the band) is in a more stable place in his personal life, and it is reflected through the album. The sound is no longer on the verge of collapsing in on itself; it is standing solidly on both legs, looking very much towards the future. This entry was posted in Reviews and tagged album review, Frightened Rabbit, Painting of a Panic Attack on April 11, 2016 by Juliana Van Amsterdam.